Great rest guaranteed, wherever you lie down to sleep. This ORIGINAL Size LaidBack Sleeping Pad Dimensions are 72" x 24" x 2 3/8" When Rolled Out, and it Rolls Up to 13" x 12" x 24" for carrying. Weighing 8.5 lbs, the ORIGINAL LaidBack Sleeping Pad, is still LIGHT Enough to make carrying it short distances a dream compared to other camping beds, and it's built in heavy duty straps make it super easy to carry from your car to your sleep destination. The LaidBack Pad was made to offer a sleeping experience similar to sleeping in your own bed. 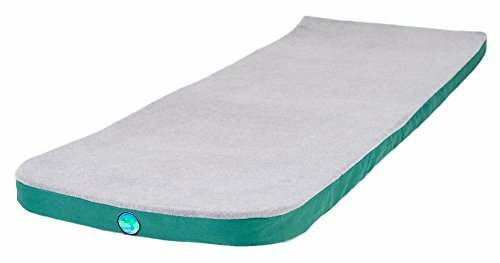 It's SOFT Polar Fleece top makes it very comfortable to rest on, EVEN without a sleeping bag between you and the pad; It's Proprietary Foam Layering CONTOURS to your Body, and Compensates for the irregularities of the ground beneath you, making uneven surfaces comfortable and assuring that your body will never hit the bottom. The LaidBack Pad features a REMOVABLE, Machine Washable Cover for CLEANING, and 600 Denier Polyester Fabric Casing for Durability. The LaidBack Pad is an Ultra COMFORTABLE Sleeping Pad, although it is not intended to be an Ultralight Sleeping Pad for long back packing trips. The LaidBack memory foam sleeping pad is NOT Water Proof; Use at your own discretion in damp or wet conditions.